From the flu is real department... 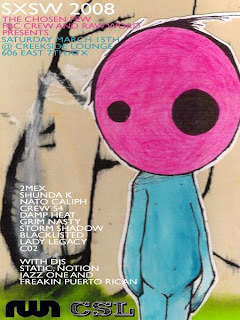 The Chosen Few, FBC Crew and Raw Word presents on March 15th @ Creekside Lounge are 2Mex, Shunda K, Nato Caliph, Crew54, Damp Heat, Grimnasty, Stormshadow, Blacklisted, Lady Legacy, CO2 and your DJs for the night are Static, Notion, Jazz One, and Freakin Puerto Rican. The Visionaries is a hip hop group from Los Angeles. The group is notable for focusing on positive issues as well as the diverse ethnic origins of its members. The group has been officially together since 1995. Amongst the group’s six members (LMNO, 2Mex, Lord Zen, Dannu, KeyKool, and DJ Rhettmatic), they’ve released over twenty solo and side projects, including four full-length albums as a group on Up Above Records, “Galleries” (1997), “Sophomore Jinx” (2001), “Pangaea” (2004) and “We Are The Ones” (2006). They have collaborated with some of the finest talents in hip-hop, and blessed stages alongside a long list of luminaries including: Wu-Tang Clan, Nas, Common, Mos Def, Talib Kweli, Dilated Peoples, De La Soul, Blackalicious, and Jurassic 5. Pushing forward independently and spreading universal love through art, the Visionaries are breaking down barriers with their own brand of message music. The group was acknowledged for their positive impact and contribution to hip-hop in 2005, as they were formally inducted into the Universal Zulu Nation. Their music was also recently featured on the MTV feature film “Volcano High”, the Warner Brothers’ box-office hit “Oceans Twelve”, and one of Midway’s best-selling video games of 2005 “Blitz: The League”.